The NAI Horizon retail team negotiated a long-term lease for 29,192 SF for its client, Planet Fitness, at the Mercado at Scottsdale Ranch. PHOENIX, ARIZONA (Jan. 2, 2018) – The sale of two industrial sites in the Southeast Valley and a series of long-term leases for Planet Fitness locations around the Valley highlight recent deals closed by NAI Horizon professionals. John Filli negotiated the sale of a 65,779 SF industrial property on 9.82 acres, representing both the buyer, Rolling Plains Construction, Inc., and the seller, 4K Properties LTD, for $3.17 million. The property is located at 5051 S. Warner Dr. and 5136 S. Desert View Dr., in Apache Junction, AZ. Denise Nunez negotiated the sale of a 53,700 SF self-storage property, representing the seller, Budget Storage Development, LLC, for $2.05 million. The property is located at 2511 E. 17th Ave., Hutchinson, Kansas. The seller, WC Capital, LLC, was represented by Jerome Castillo with Titan Realty. John Filli negotiated the sale of a 17,966 SF industrial property, representing the seller, 4K Properties LTD, for $1.727 million. The property is located at 1350 W. Harwell Rd., Gilbert, AZ. Mike Parker with CBRE represented the buyer, Bio Huma Netics, Inc.
Rick Foss negotiated the sale of a 10,058 SF office property, representing the seller, AZ CE Properties, LLC, for $960,000. The property is located at 4848 S. 35th St., Phoenix, AZ. Matt McDougall with Lee & Associates represented the buyer, Pacific Desert, LLC. Chris Gerow, Shelby Tworek, Gabe Ortega and Patrick Anthon negotiated the sale of a 37,433 SF pad, representing the seller, The Marketplace at Estrella Falls, LLC. The property is located at 1600 N. Pebble Creek Parkway, PAD 14, Goodyear, AZ. Joe Doucett with Newmark Grubb Frank represented the buyer, Nevada RE Manager, LLC. Chris Gerow, Shelby Tworek, Gabe Ortega and Patrick Anthon negotiated the sale of a 38,000 SF pad, representing the seller, The Marketplace at Estrella Falls, LLC. The property is located at 1600 N. Pebble Creek Parkway, PAD 3, Goodyear, AZ. Max Bippus with CBRE represented the buyer, CAI Investment Sub Series 301, LLC. Denise Nunez negotiated the sale of a 162,471 SF tract of land, representing the buyer, Terdenjo Storage, LLC, for $700,000. It is located at the NEC of Yuma Rd & Sundance Parkway, Buckeye, AZ. Chris Ackel with CBRE represented the seller, Sundance Parkway, LLC. Tyler Smith negotiated the sale of a 2,647 SF office property, representing the seller, R2R, LLC, for $695,000. The property is located at 16968 W. Bell Rd., Surprise, AZ. David Wilson with Daum Commercial represented the seller, Wall Properties, LLC. Michael Gaida negotiated the sale of a 768 SF office property, representing the seller, CAI, LLC, and the buyer, Silver Peak IP, LLC for $77,000. The property is located at 2701 E. Thomas Rd., Phoenix, AZ. Chris Gerow, Shelby Tworek, Gabe Ortega and Patrick Anthon represented the tenant, JEG-FIT Gilbert & Warner Rd, LLC in a 120-month retail lease for 28,000 SF at the SEC of Gilbert & Warner Rd., Gilbert, AZ. Jason Herkser with Capital Asset Management represented the landlord, MGD Holdings, LLC. Tyler Smith and Troy Giammarco represented the landlord, Bay Pacific Corporate Center, LLC in an 84-month office lease for 26,072 SF at 10220 N. 25th Ave., Phoenix, AZ. Jason Malcom and Rod Beach with CRESA represented the tenant, Sage Academy, Inc.
Chris Gerow, Shelby Tworek, Gabe Ortega and Patrick Anthon represented the tenant, JEG-FIT Via Linda & Mountain View Rd, LLC in a 138-month retail lease for 29,192 SF at 10105 E. Via Linda Rd., Scottsdale, AZ. 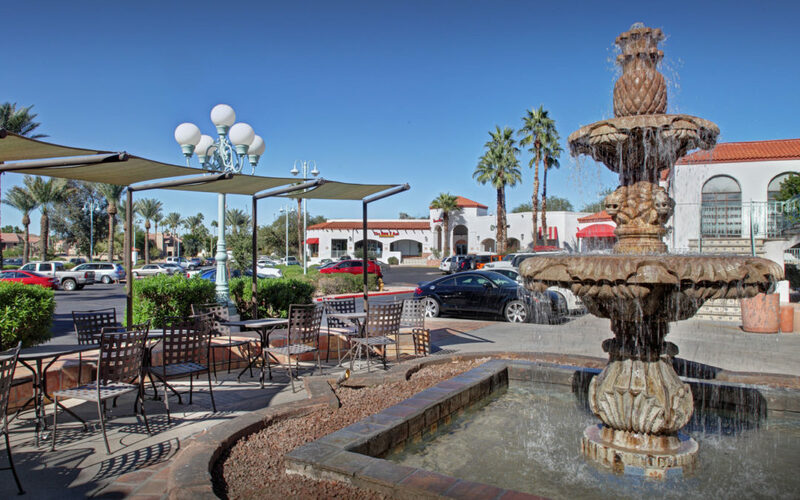 Chris Gerow, Shelby Tworek, Gabe Ortega and Patrick Anthon represented the tenant, Lux Nail Bar in a retail lease at 4747 E. Cactus Rd., Phoenix, AZ. Mark Wilcke represented the landlord, Native Arizonan Acquisitions VII, LLC in a 68-month lease for 3,350 SF at 1824 E. Indian School Rd., Phoenix, AZ. John Asher with AT Real Estate Services represented the tenant, Delafit, LLC. Matt Harper represented the landlord, TSP Metro Gateway, LLC in a 60-month retail lease for 2,000 SF at 3315 W. Peoria Ave., Phoenix, AZ. Austin Ferozco with West USA Realty represented the tenant, Avancy Bridal, LLC. Kevin Higgins, Barbara Lloyd and Lane Neville represented the landlord, Bogle Family Realty, LLLP in a 60-month office lease for 1,666 SF at 7227 N. 16th St., Phoenix, AZ. Antoinette Olea with HomeSmart represented the tenant, Law Offices of Alan M. Ortega, PLLC and Daniel R. Ortega III, PLLC. Chris Gerow, Shelby Tworek, Gabe Ortega and Patrick Anthon represented the landlord, New Bell Tower, LLC, in a 36-month retail lease for 3,100 SF at 4925 W. Bell Rd., Glendale, AZ. Chris Gerow, Shelby Tworek, Gabe Ortega and Patrick Anthon represented the tenant, MacDonald Management, LLC in a 60-month retail lease for 1,240 SF at 4015 E. Bell Rd., Phoenix, AZ. Alan Zell with Zell Commercial represented the landlord, Nelson Properties, LLC. Matt Harper represented the landlord, LASA Realty, LLC in a 60-month retail lease for 1,200 SF at 7448 W. Glendale Ave., Glendale, AZ. Chris Gerow, Shelby Tworek, Gabe Ortega and Patrick Anthon represented the landlord, New Bell Tower, LLC, in a 36-month retail lease for 1,920 SF at 4925 W. Bell Rd., Glendale, AZ. Matt Harper and Sharon Reeves represented the landlord, SJ & SM, LLC, in a 63-month retail lease for 1,250 SF at 5118 W. Northern Ave., Glendale, AZ. Tom Bean, CCIM, and Laurel Lewis represented the tenant, Todd Lemay & Letitia Lemay in a 14-month lease for 4,959 SF at 8720 S. Kyrene Rd., Tempe, AZ. Jackie Orcutt with CBRE represented the landlord, EJM Kyrene Property, LLC. Rick Foss represented both the tenant, CANA Communications and the landlord, Gerald M & Diane M Olson Revocable Living Trust, in a 24-month industrial lease for 2,800 SF at 105 N. 30th St., Phoenix, AZ. Matt Harper represented the landlord, Copper State Land, LLC, in a 24-month retail lease for 1,400 SF at 5717 W. Glendale Ave., Glendale, AZ. Vinny Summo with Bryant Commercial Real Estate represented the tenant, Veggie Rebellion, LLC. Matt Harper represented the landlord, Maz Northern Plaza, LLC, in a 24-month retail lease for 850 SF at 5008 W. Northern Ave., Glendale, AZ.